The ensemble is led by Nigerian master percussionist Najite Agindotan who was mentored and eventually taken as a godson by the late, great Fela Anikulapo Kuti. This 16+ piece ensemble embraces the restless genius of Fela's afrobeat music as well as expanding into their own unique blend of jazz, funk, highlife, and traditional West African drumming and folk song. Many of Southern California's best instrumentalists have lent their talent to N.O.P. over the years--Phil Ranelin, Nate Morgan, Bobby Bryant, Jerri Jheto, Jim Thompson, the late, great Billy Harris and many more-- the current band represents a cross-generational accumulation of their spirit and wisdom. The message of the Olokun Prophecy is that there is an Age of Goodness coming and we must help to usher it in together. Mabiba is an internationally acclaimed teacher, drummer, and choreographer of traditional and contemporary African dance. Mabiba was born in Brazzaville, Congo, and initiated into dancing by her grandparents at the age of eight. 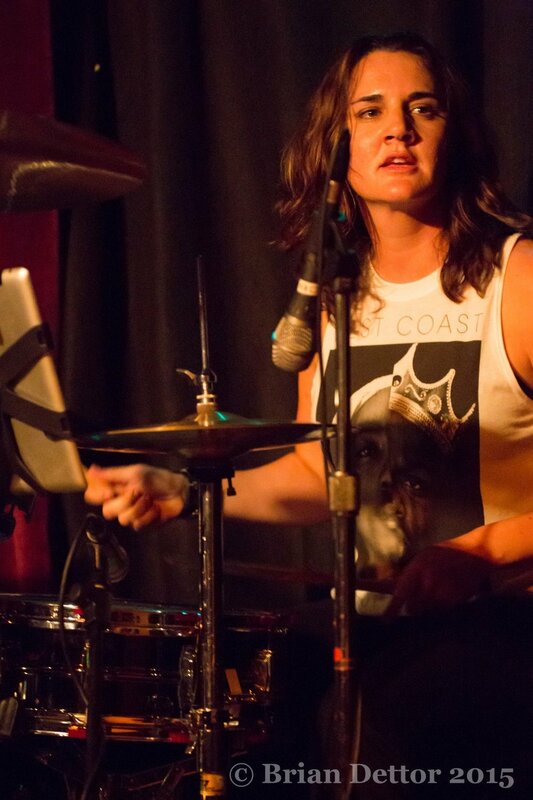 Mabiba is also an inspiring drummer. In addition to her Congolese dancing, for many years she studied West African Dunun drumming with master drummer Famoudou Konate in Guinea, and she was the first woman to teach this form in the U.S. Mabiba is also an acclaimed singer and has toured and recorded with Salif Keita, master drummer Mamady Keita, and Samba Ngo. Sistahs of the Drum are students and teachers, listeners and communicators, consumers and creators, protectors and nurturers, friends and lovers. We drum from the heart, for the heart, to the heart, and with our heart. Absorbing the teachings of West African rhythms, songs, and dances, Sistahs of the Drum respectfully represent the essence of our traditional African roots in harmony with our African-American cultural rearing. The resulting sound is from somewhere deep within; playing through us and resonating with you. Current members are Mar Stevens, Sandy Mills, Charlene Gumbs, Shawn Nealy-Oparah, La Tanya Carmical, Mya Cross, Nina Roberts and Jillian Lyles. Proclaimed as one of the “purest contemporary voices” by NPR, powerhouse Amikaeyla embraces the best of many types of music. Her sultry sound is “like listening to velvet waterfalls” (MTV) and her soulful flavor captures the listener with dynamic passion and sincerity. Winner of Eight Washington Area Music Association Awards for Best Jazz, World and Urban Contemporary Vocalist, Amikaeyla was named DC’s best female composer; won the DC Mayor’s Arts Award for Innovation in the Arts, and was recently honored with first prize for Best World Music Composition from the Maryland State Arts Council. She has studied, recorded with, and shared the stage with many award winning artists, including Take 6, Sweet Honey In The Rock, Baba Olatunji, Mickey Hart, Gil Scott Heron, Wyclef, Pete Seeger, Shiela E and Esperanza Spalding to name a few. Her strong academic interest in Sacred Ethnomusicology led her to study with many spiritual and musical masters from many different cultures, and she was invited to perform in India at the Inaugural Festival of Sacred Chanting and Singing for the commemoration of the Golden Buddha at the request and invitation of His Holiness the Dalai Lama. Currently, Amikaeyla serves as a Cultural Arts Ambassador for the US State Department and for over the past 15 years she has travelled the world extensively as a liaison between communities and fostering relationships amidst artists, healers and the general populace by designing strategy platforms which allow different cultures and nationalities to gather together and address issues concerning our communities at large. As the Founder and Executive Director of the International Cultural Arts & Healing Sciences Institute (ICAHSI), she has appeared internationally on numerous radio and television programs performing and speaking about her “Music As Medicine - Healing with an Artful Purpose” programming - a multi-faceted therapeutic approach through music, movement, & theater modalities. This program has been implemented around the world to at-risk women and children hoping to aid in alleviating pain and trauma caused by war. She is the proud recipient of the Voss Foundation Emerging Leaders Women Helping Women Award, Global Woman Award, the Pioneer Award for Exemplary Leadership and Outstanding Service in Social Justice and Advocacy Award, and the Hero for Peace and Forgiveness award. Susu Pampanin: Spirit of Sultana is a women’s percussion ensemble focused on drums, songs and dance from Egypt, Morocco and beyond. Pampanin’s heartbeat is her drum; her life stories are her songs; her dreams are her dances. Working most recently with singer Holly Near, she has been heard in numerous world music groups including Keith Terry’s Crosspulse, Wild Mango and Stellamara. Respected world-wide as a master of Arabic drumming, she leads Spirit of Sultana in songs, timeless melodies, intricate improvisations both melodic (taqasim), and vocal (mawwal, reminiscent of the ancient call to prayer) while highlighting the percussive sounds of its Middle Eastern rhythm section. The music draws inspiration from Andalusian, Tarab (Classic), Sufi, popular and folkloric genres. Pampanin says, “Spirit of Sultana aspires to take you to a faraway place, where the spirit of the queen lives.” In addition to Pampanin the group features percussionist-dancers TerriAnne Gutierrez and Amina Goodyear; oud player, singer and percussionist Fatima Zohra Lahlou and percussionist Mohini Rustagi. Women's Jam & Fundraiser for the Maestra Series! Hosted by Shelley Doty (guitar and vocals), Angeline Saris (bass) and Denise Martin. Open jam sign up, all genders welcome. Shelley Doty is known for her masterful guitar licks, soulful voice and charismatic stage presence. Her original tunes are sprinkled with respect for the music of her youth (rock, R&B, jazz, funk), and are sung and played with an authentic raw energy that cuts through the air with jubilant imagination and freshness. In addition to performing and recording her own material, Shelley is a versatile lead guitarist . As well as fronting her own band the Shelley Doty X-tet, she currently spends much of her time playing with Skip The Needle (featuring Vicki Randle, Kofy Brown and Katie Colpitts). 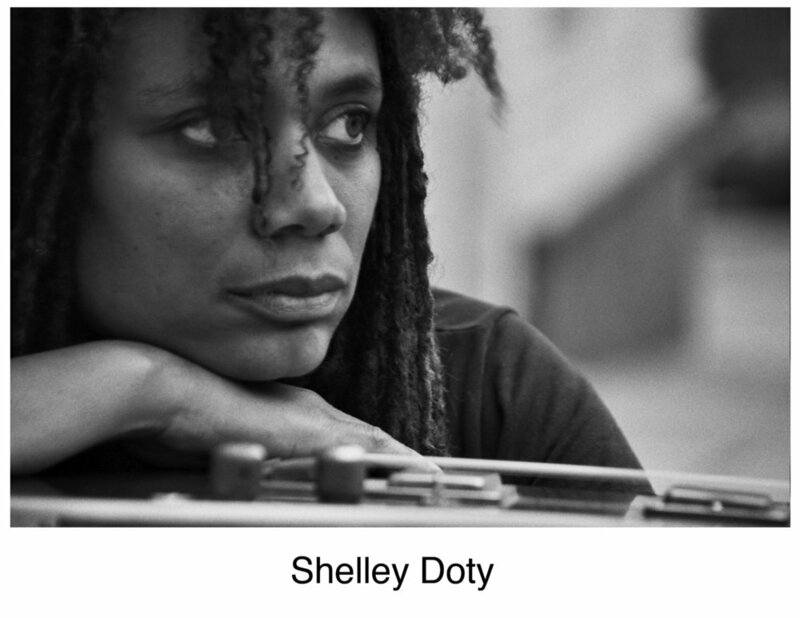 Shelley was one of the founders of jamband legends Jambay, and has played with and recorded CDs withl Bonfire Madigan, Pyeng Threadgill, Gina Breedlove, Dawn Richardson (of 4NonBlondes) and Cris Williamson among many others. Her musical range runs the gamut from tender acoustic music, to raucous kinetic electric Funk Rock, and as a musician, Shelley Doty is well respected as one of the preeminent guitarists in the Bay Area and beyond. Denise Martin began playing drums at age 16 and was touring the US, Asia and Europe before her 20th birthday with legendary artist, Merl Saunders. She went on to tour with several artists including Sony recording artist, Eric Martin. She inked endorsement deals with Paiste cymbals, Regal Tip sticks and Evans heads early on in her career and was welcomed at NAMM show with a life-sized display of her promo photo for the “Women of Paiste” booth. Denise has recorded major label albums and several indie releases as well as sessions for commercials, soundtracks and various online projects. One minute of Angeline Saris' low-end thumping coming at you and you’ll know she is just as much beast as beauty. She is a monstrous talent and has the schedule to prove it. 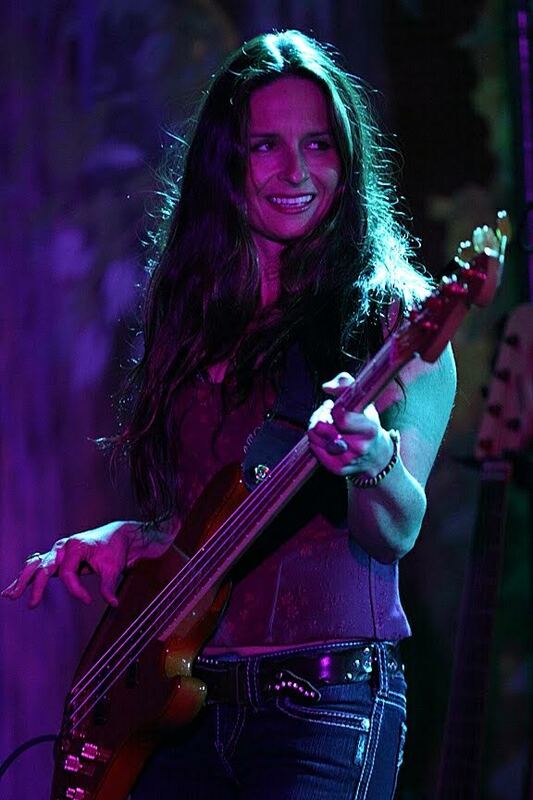 In the last year alone, Angeline recorded 2 albums and toured with the Narada Michael Walden Band, rocked the stage with Santana when he joined Narada’s band at their most recent show, joined forces with reggae and ska legend Ernest Ranglin, laid down some serious shredding bass on Gretchen Menn’s album Hale Souls (and works regularly as her touring bassist), recorded 4 instructional DVD’s for Hal Leonard as well as a demo video for GHS strings, joined the all-female Led Zeppelin tribute band Zepparella and continues to moonlight as a hired gun in the studio and for local shows.